The demineralisation and remineralisation cycle needs to be controlled in order to prevent the decomposition of dental tissues. 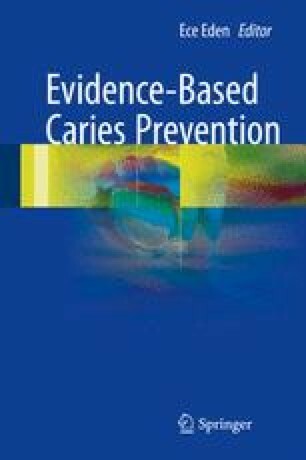 The use of fluoridated products, especially the consumption of fluoridated water and use of fluoridated toothpaste, provides significant reduction in caries risk in a cost-effective manner. Fluoride has also been used as a caries-preventive agent in varnishes and gels; for decades anti-fluoride propaganda questioned the public and the dental sector about its safety. Therefore, it is important to discuss the pros and cons of fluoride therapy using scientific evidence. More recently, a number of products containing calcium and phosphate have been released onto the market – these products use a variety of technologies and have varying levels of evidenced-based justification. The mechanisms of action of fluoride- and calcium-based technologies will be discussed in detail. Morbidity and Mortality Weekly Report. Fluoridation of drinking water to prevent Dental caries. In: Services Usdohh, editor. Centers of Disease Control as te author – i.e. Centers of Disease Control. Fluoridation of drinking water to prevent dental caries. MMWR. 1999;48(41):933–40. https://www.cdc.gov/mmwr/preview/mmwrhtml/mm4841a1.htm. Yeung CA, Chong LY, Glenny A-M. Fluoridated milk for preventing dental caries. Cochrane Database Syst Rev. 2015;(9):CD003876. doi: 10.1002/14651858.CD003876.pub4. Tubert-Jeannin S, Auclair C, Amsallem E, Tramini P, Gerbaud L, Ruffieux C, et al. Fluoride supplements (tablets, drops, lozenges or chewing gums) for preventing dental caries in children. Cochrane Database Syst Rev. 2011;(12):CD007592. doi: 10.1002/14651858.CD007592.pub2. Marinho VCC, Worthington HV, Walsh T, Chong LY. Fluoride gels for preventing dental caries in children and adolescents. Cochrane Database Sys Rev. 2015;(6):CD002280. doi: 10.1002/14651858.CD002280.pub2. Marinho VCC, Higgins JPT, Sheiham A, Logan S. One topical fluoride (toothpastes, or mouthrinses, or gels, or varnishes) versus another for preventing dental caries in children and adolescents. Cochrane Database Syst Rev. 2004;(1):CD002780. doi: 10.1002/14651858.CD002780.pub2. Marinho VCC, Worthington HV, Walsh T, Clarkson JE. Fluoride varnishes for preventing dental caries in children and adolescents. Cochrane Database Syst Rev. 2013;(7):CD002279. doi: 10.1002/14651858.CD002279.pub2. Shen P, Bagheri R, Walker GD, Yuan Y, Stanton DP, Reynolds C, et al. Effect of calcium phosphate addition to fluoride containing dental varnishes on enamel demineralization. Aust Dent J. 2015. doi: 10.1111/adj.12385.